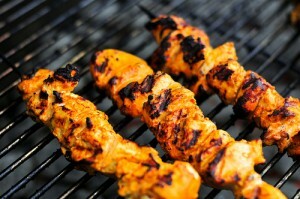 Marinated Chicken Kababs recipe by Nazia Nazar at DesiRecipes.com. 1 small onion , sliced and separated into ringsa little lemon juice. Cut the chicken into 3.5 cm (1 ) cubes. Mix together the oil, vinegar , garlic , ginger , garam masala, coriander, cumin, black pepper , 2 tbsps. of fresh coriander, salt to taste and the yoghurt. Put this marinade into a dish and stir in the chicken pieces. Cover and leave for at least 4 hours, or preferably overnight, in a refrigerator. Thread the marinated chicken cubes onto metal or bamboo skewers, leaving a little space in between each piece of chicken . Place over a hot grill and cook until golden brown. Baste the chicken occasionally with the remaining marinade. To serve, mix the onion rings and sprinkle some lemon juice on top just before serving and top with strawberry and mango salad.